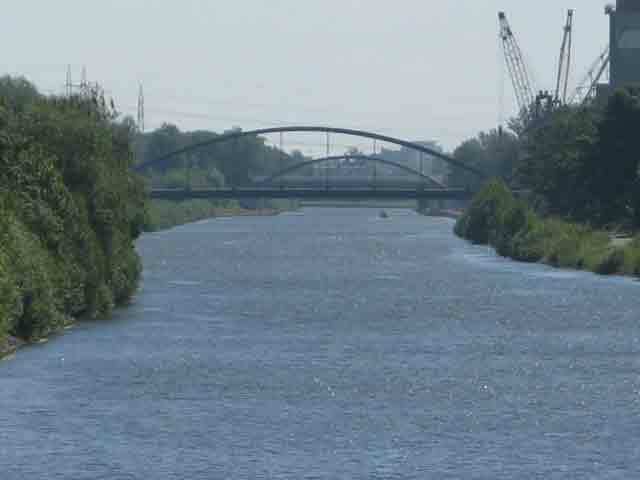 The Aller River Valley, sometimes advertised as the Aller-Leine Tal, takes one on a meander along a flat river drainage to either the town of Helmstedt or Magdeburg. 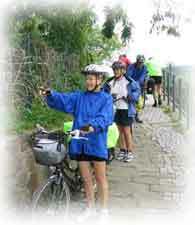 We ride up the river, knowing it is flat most of the way and end our tour in Helmstedt. Tour Overview: June, 2010. 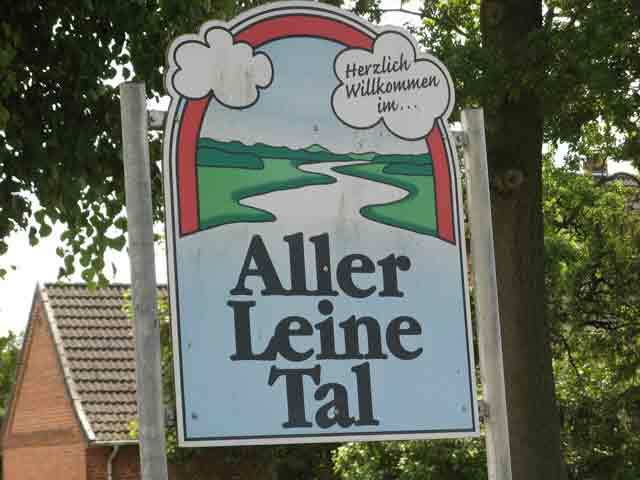 Our tour of the Aller is 154 mile (284 km) from Verden near the Weser River to Helmstedt. 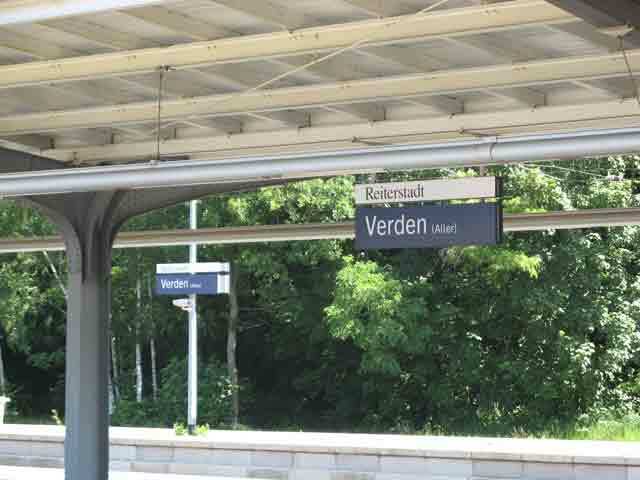 The ride takes us five leisurely days due to train rides taking us to Verden on day 1; and then from Helmstedt on day 5. 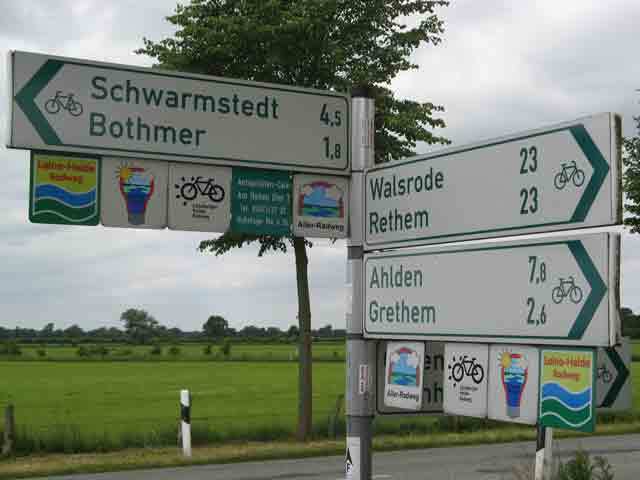 Our bikeline guidebook map starts in Bremen, 48 kilometers north of Verden and ends in Magdeburg, about 10 kilometers farther than Helmstedt. 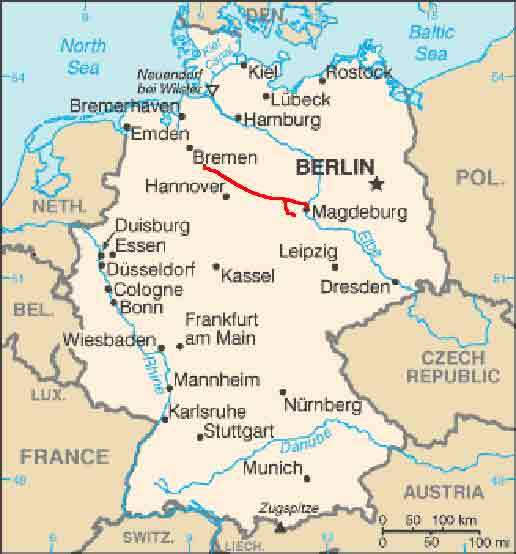 We have visited both Bremen and Magdeburg over the last few years but we have not yet been to Helmstedt. We did not encounter any hills until we got to Wolfsburg. From Wolfsburg on there were a few hills but they were not memorable. The exception is the one just before our lodging outside of Weferlingen on Day 4. Most of the route is on paved bicycle paths or low-traffic roads. However there are many short portions of hard-packed gravel. Signage: Signage is adequate to our needs along the Aller but it never hurts to keep the names of the next few towns in your head as you ride. There may be times when you see the name of a town that is not on your list of places ahead of you and it is smart to check the guidebook or map at that time. Accommodations: There are plenty of overnight accommodations along the way. We try to stay in Zimmer on these tours. Zimmer, actually a room for rent in a private home that usually includes breakfast, are the least expensive forms of lodging. However, we are unsuccessful in finding that type of lodging on this tour and end up in hotels of various types. For a discussion on all types of overnight accommodations, click the link. 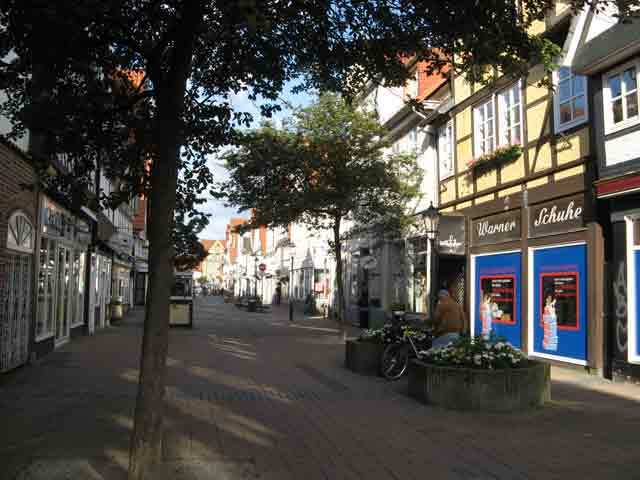 Stops: We liked the cities of Verden, Celle, and Gifhorn but we did not take the time to explore perhaps the largest two cities on the tour, Wolfsburg and Helmstedt. Maps and Guidebooks: We used the bikeline Aller-Radweg, Von Bremen nach Magdeburg; published by Verlag Esterbauer GmbH, 2007. Day Overview: We the start in Verden but today is a short ride of only 23 miles (37 km) because of a morning train ride and time spent in Verden. There are no hills and not much gravel either. Mile 0 (0.0 km): We start our cyclometers at the Verden Bahnhof. Verden first mentioned in the chronicles in 810. But it is known that Charlemagne (742 814) slaughtered about 4,500 pagan Saxons near here in 782. 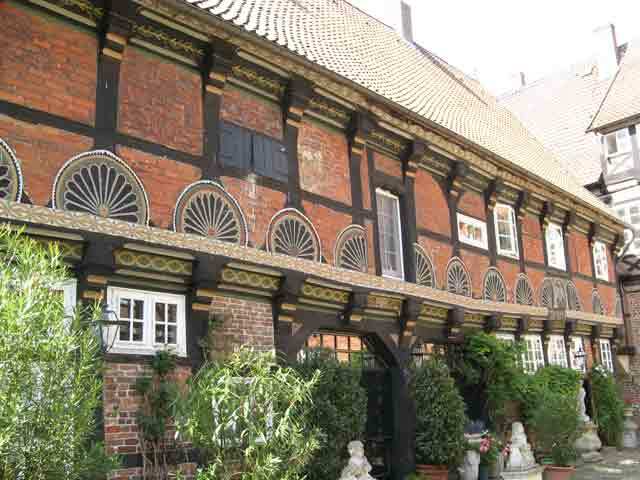 Until 1667, Verden was actually two villages; a north village and a south village. The villages combined when the Thirty Years War ended in 1648. The northern community had been a fishing village but the people in the southern community engaged in agriculture. During WWII, Verden had a slave labor furniture factory. Afterwards the city became the headquarters for a British Army unit whose buildings now house some regional governmental offices. 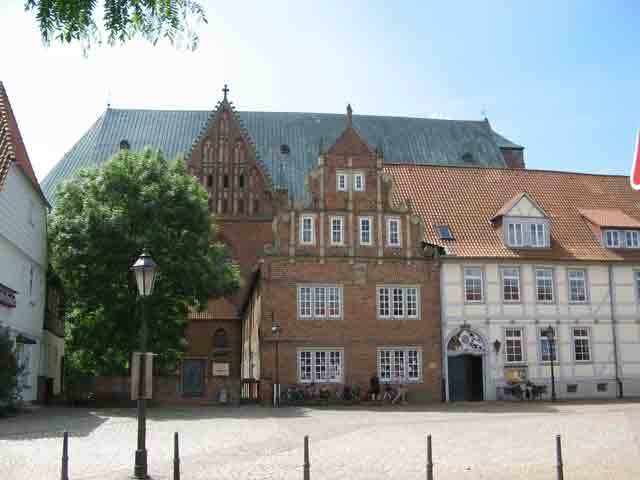 The Verden Dom, or Cathedral was first built in 850 and then rebuilt in 950. 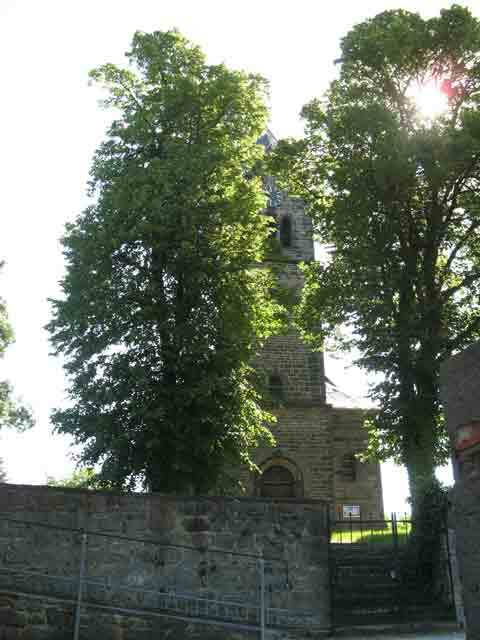 In 1028, they built the building in stone as a ‘Gothic hall-style church,’ an unusual style in which it remains. 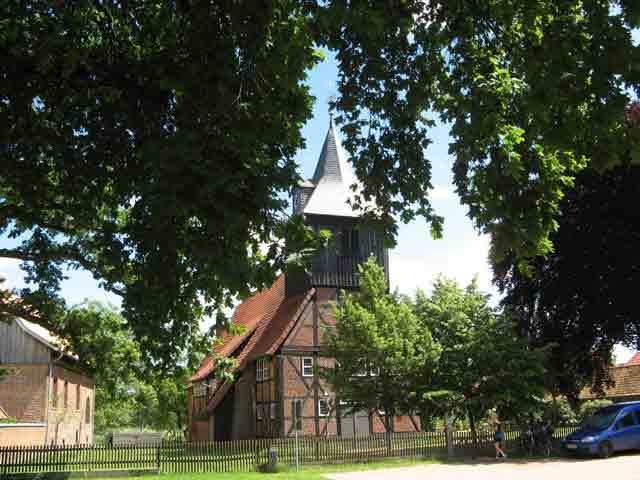 It may be the oldest hall church in Germany. It was finally finished in 1150 and remodeled again in 1185. 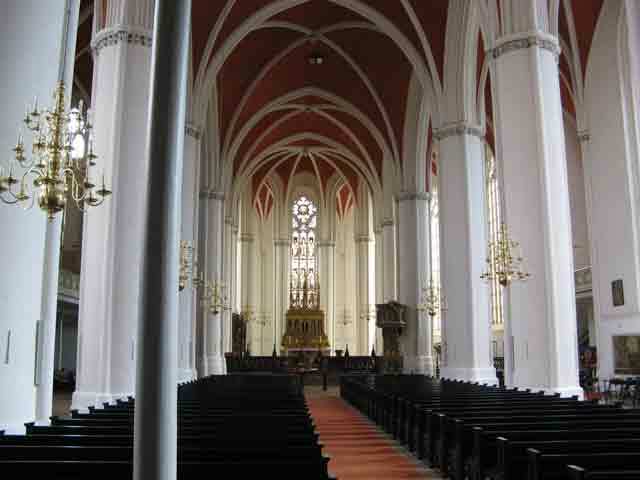 This Cathedral is not as elaborately decorated as many Catholic churches because it is a Protestant church. Mile 10.8 (17.3 km): Westen. They have a nice maypole in the center of the town. These maypoles advertise the guilds of the area. Between Westen and Hülsen, one could stay on the mapped bike path or take a shortcut on the bike path alongside the main road. Both are acceptable but we prefer the more scenic path following the river. 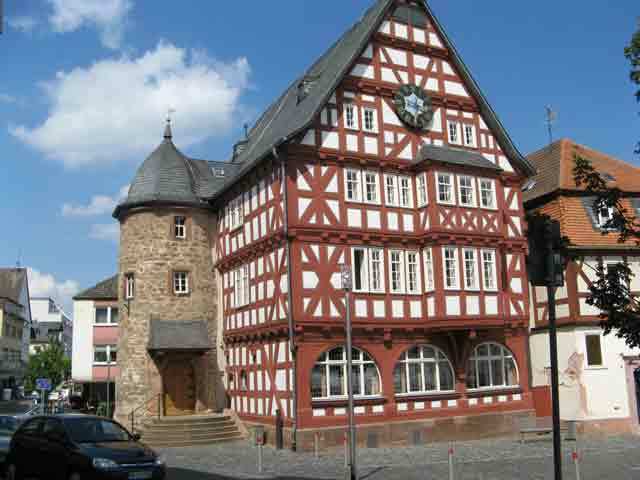 Mile 18.0 (29.0 km): This is Rethem and it has been a city since 1353. While we have been riding on a gravel path for the last 5 kilometers, it is packed and not a bad surface regardless of its primitive appearance. 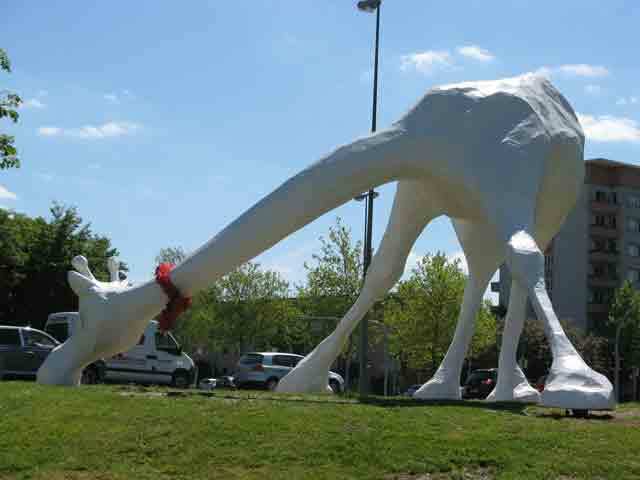 As we ride through the Rethem park, we remark how interesting the sculptures are. 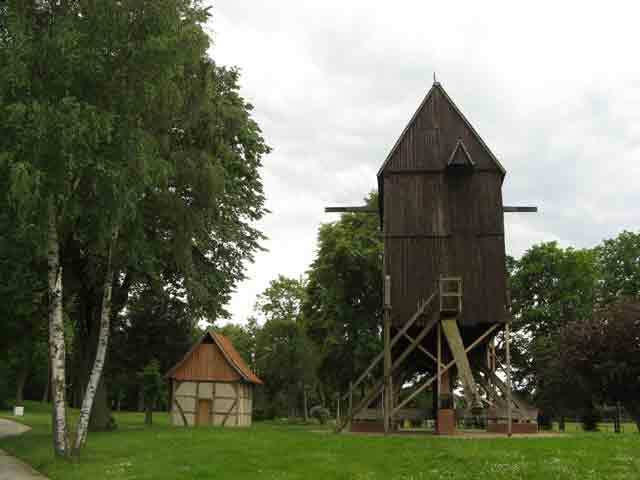 We also find an example of a Bockwindmühle, or an old style windmill popular during the Middle Ages. They were replaced by more efficient Dutch type windmills in the 19th Century. 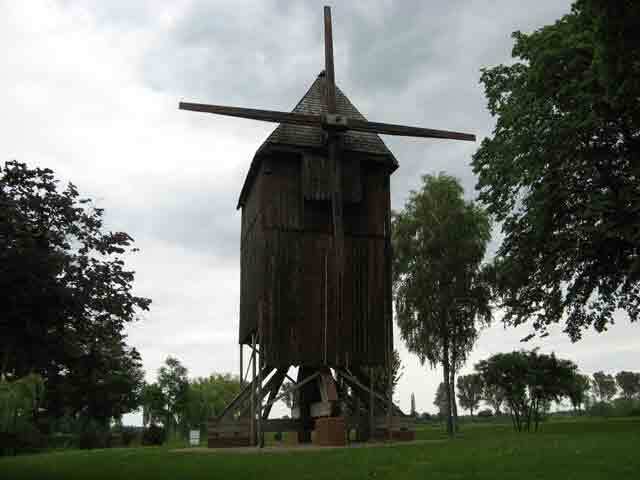 This windmill was built in 1594 and moved here from a nearby village. 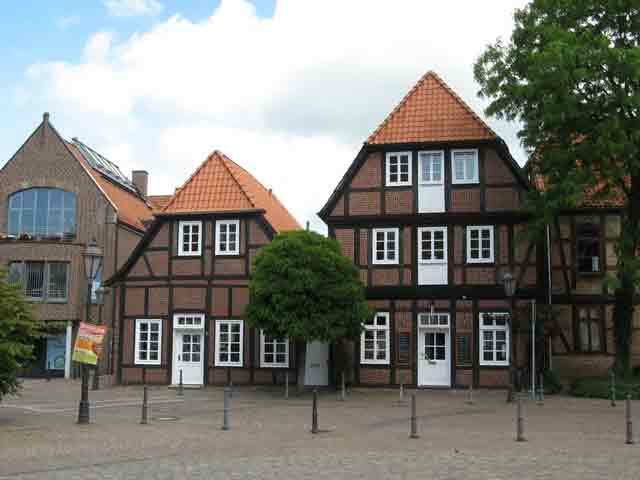 Mile 22.0 (35.4 km): This is the center of Frankenfeld. Mile 23.1 (37.2 km): We stop for the night just outside of Bosse, at Hotel-Restaurant Allerhof, a “Bett and Bike” establishment. 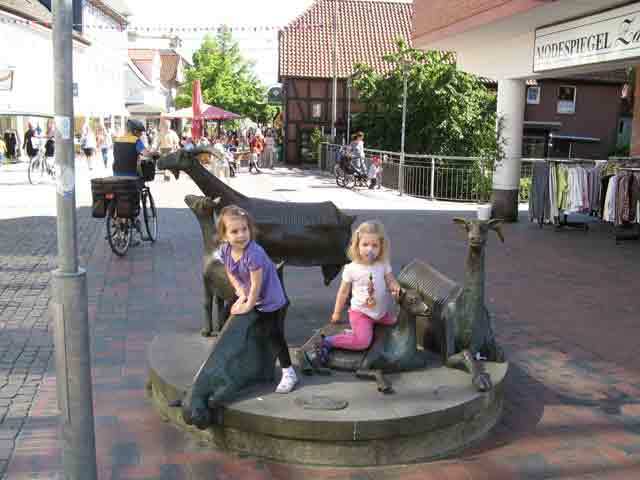 It is owned by Kerstin and Heinrich Rodewald, Lindenallee 4, 27336 Frankenfeld / Bosse, Telephone 05165-567. You can email them at rodewald@hotel-allerhof.de and their website is http://www.hotel-allerhof.de. They charge €65 for two people for one night. Day Overview: We begin today with one of the better breakfasts we have had in 11 years of cycling in Germany. Our visit at Hotel-Restaurant Allerhof was very enjoyable. The path today is still flat but there are several short parts that are gravel. Once, we tried to take a shortcut only to find deep sand and we had to backtrack to the mapped route. A total of about 25 km of the 75 km we ride today is not paved. Nevertheless, it is easy riding. The weather forecast is good and the sky is an azure blue punctuated with widely scattered, fluffy white clouds. 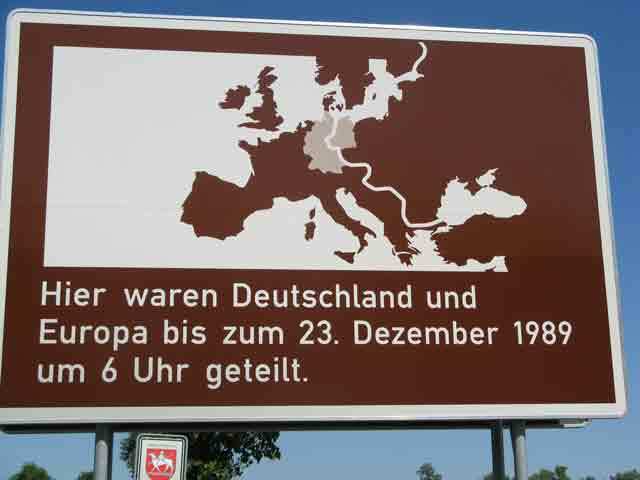 Language wise, today we seem to be on the border between the Gutten Morgen part of Germany and the Moin part. In English, both greetings mean good morning. Farther northwest of here is a region called East Friesland and the lowlands of Germany where Low German developed as a language or at least a dialect before the time of Charlemagne. The more northeast you go, claims Maxa, the more ‘Moins’ one hears. Along the North Sea Coast, Moin-Moin is used for the 'good morning' greeting. I offer this in case you are interested, knowing that probably you are not. Mile 0 (0 km): I start my cyclometer at the hotel since it is right on the bike path. 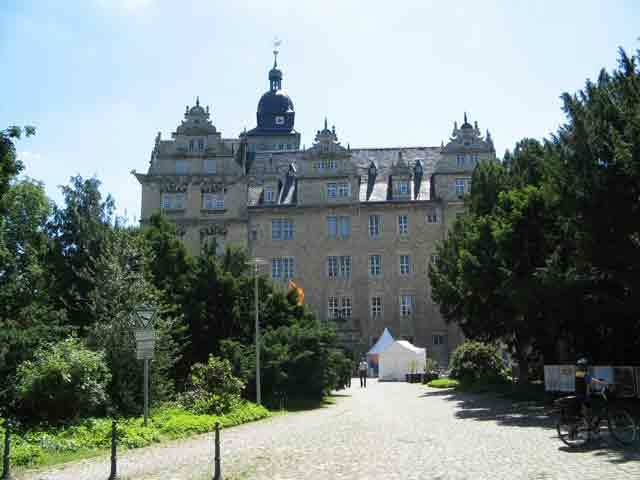 Mile 5.4 (8.7 km): We ride by a Schloss in Ahlden. A Schloss is a palace. 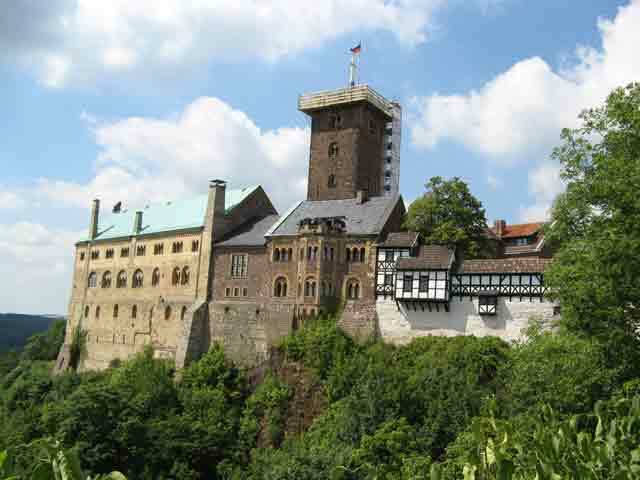 Construction of the Schloss started in 1344 but was not finished until 1613. The story is that Princess Sophie-Dorothea von Braunschweig-Lüneburg (1666-1726) fell in love with a Swede. She was married at the time, unfortunately. She asked for a divorce and then she invited her Swedish boyfriend to meet her here in Ahlden. 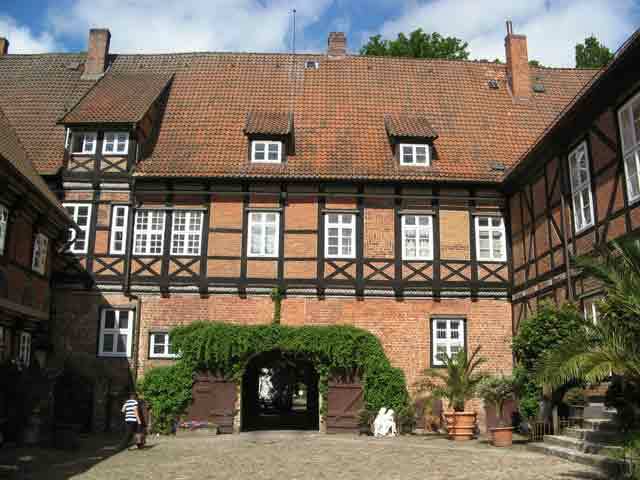 Upon arrival, Sophie’s husband had the Swede killed and then imprisoned Sophie in this Schloss for the rest of her life. From Ahlden we follow the Small Leine River for a ways before reconnecting with the Aller River. 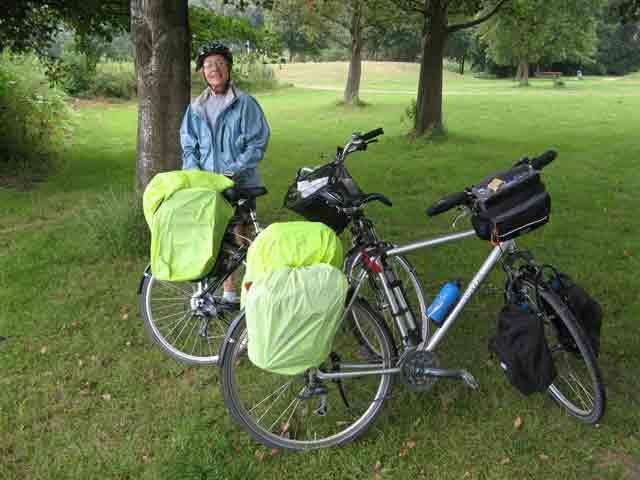 In 2006, we rode the Leine River Tour with Neil and Judith of http://www.bergstrassebikebooks.com fame. I fondly remember that ride. 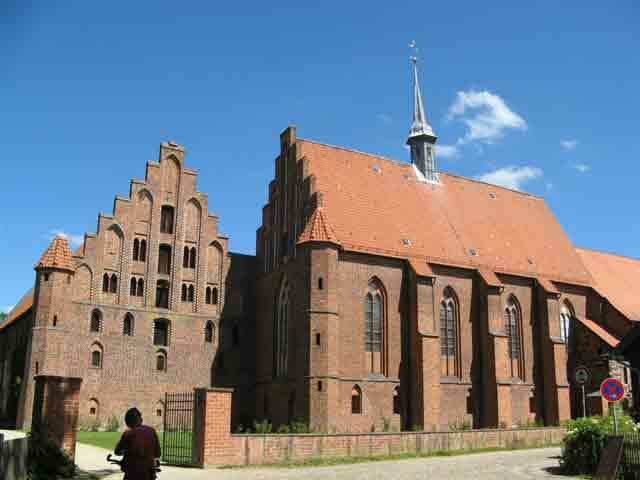 We ended the Leine tour in Hogenhagen, just a couple kilometers north of here. 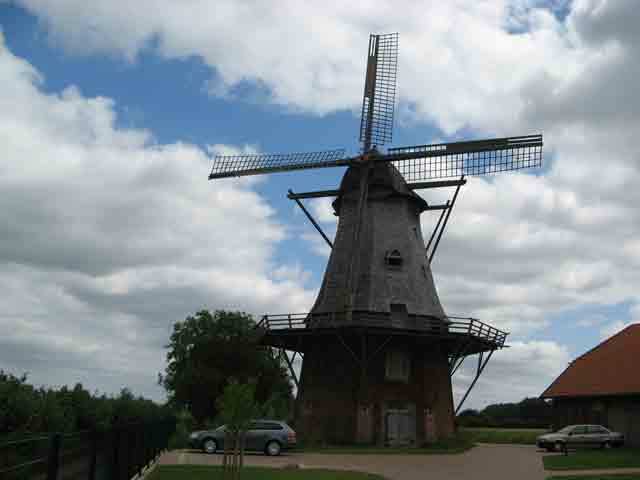 Mile 7.3 (11.8 km): In Büchten I photograph a slightly different kind of windmill. This is , built in the 19th Century. There has been a mill here since the 12th Century. 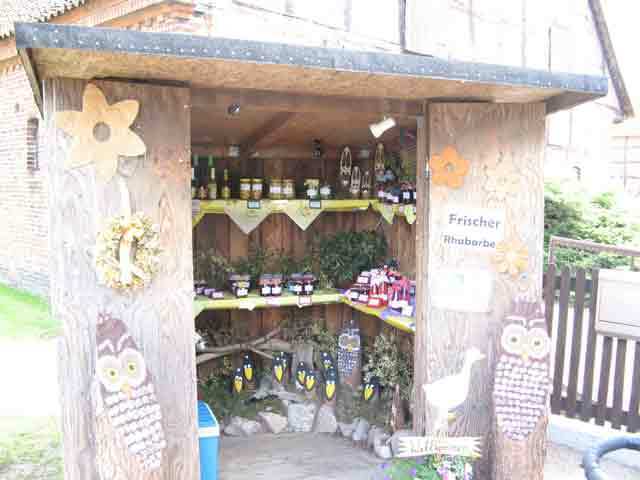 I also notice a cutely decorated roadside stand selling homemade products and homegrown agricultural goods. Just put your money in the box and take your purchase home; the honor system is at work here. 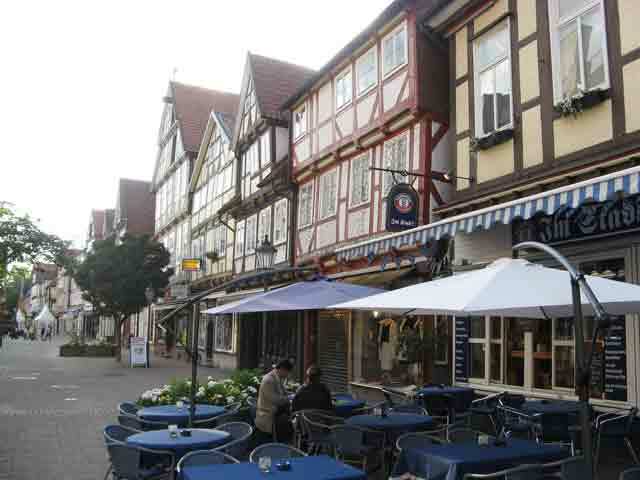 Mile 12.7 (20.45 km): In Schwarmstedt, we note that we are on the southern end of the Lüneburger Heide (Lunenburg Heath in English) an area famous as a vacation destination in Europe. Interestingly, they discovered oil here and there is an old oil well on display. Apparently, the field has been abandoned several years ago. 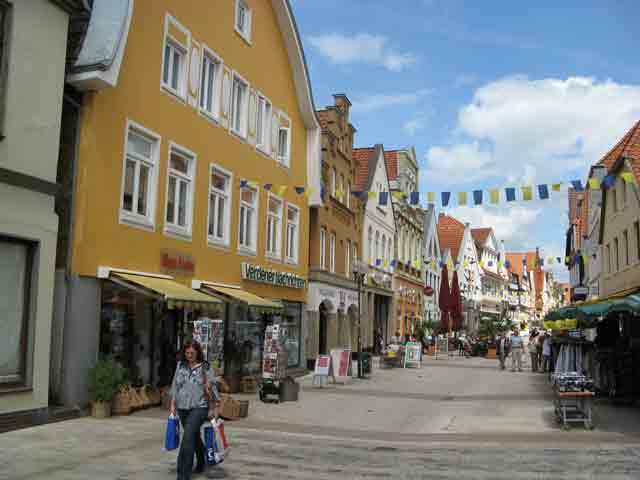 These days, Schwarmstedt is a spa town where people go to take a cure from anything that ails them from too much stress to liver problems from too much Bier. Mile 37.5 (60.4 km): This is Hambühren. We learn that in the language of old that a Bühren means a settlement. There have been settlements here since the Stone Age. The path to here has been pavement and gravel on and off since Schwarmstedt. About Mile 39 (63 km): We pass the Bahnhof in Celle. 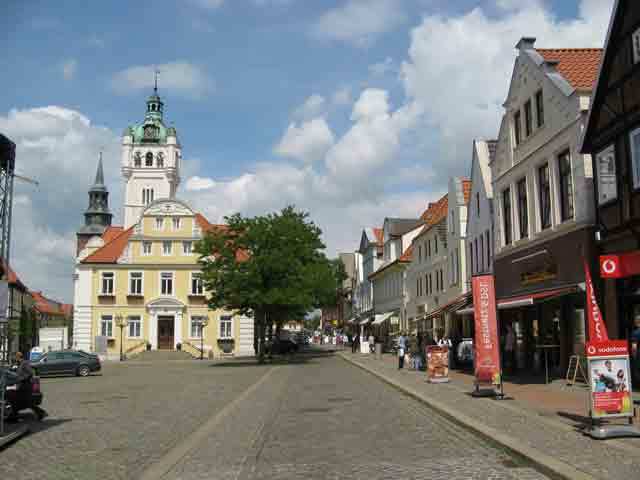 Mile 40.6 (65.3 km): Celle. 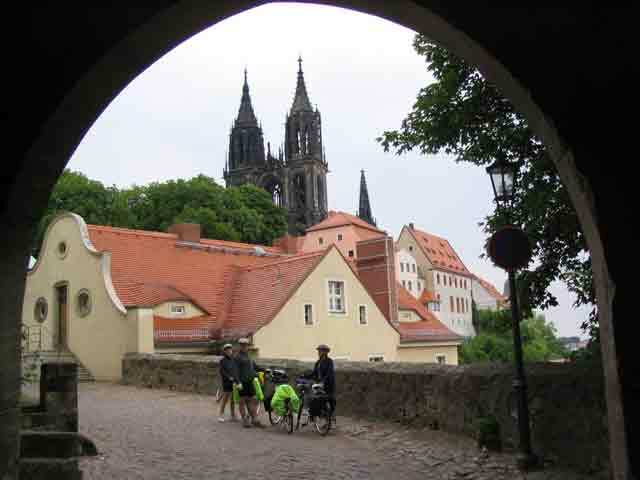 We stop here just past the Bahnhof at a tourist information office and gather an address for an overnight accommodations. 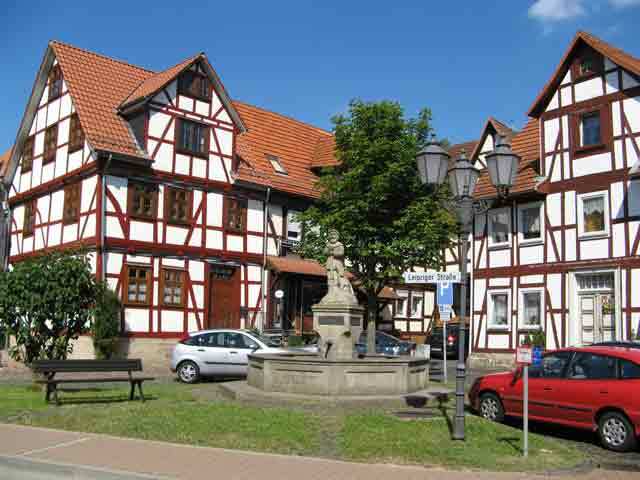 Mile 48.3 (77.7 km): Celle is full of workers who are taking many of the lodgings but we are settled for the night at Hotel Garni Thüringer Hof, Planck Strasse 17, 2922 Celle. The cost is €66 per night for two persons (2010) and the telephone is 05141-974433 and/or 05141-92880. They have 19 beds and serve a nice breakfast. 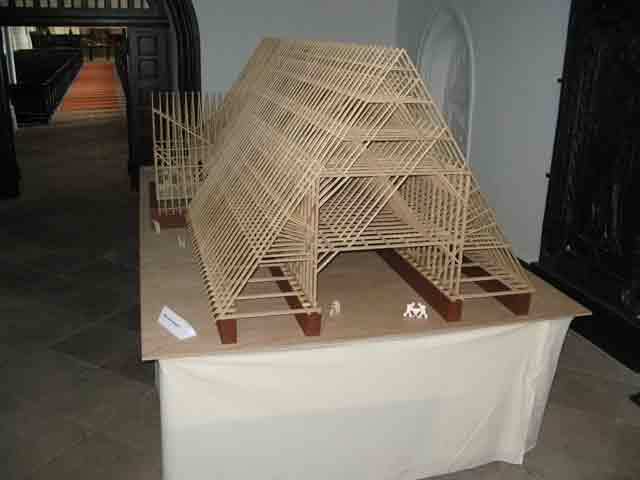 Our hosts are friendly, extraverted people both of whom are professional architects. They speak a handful of languages including English and Spanish. This hotel is in a quiet neighborhood and only 2 km from downtown where “one of every three buildings is a restaurant” according to our host; he is nearly accurate. Day Overview: We start late today but the weather is sunny and perfect for bicycling. The path seems flat again today but we know that riding upriver must be uphill, though we do not notice a climb. Like yesterday, there are frequent short stretches of hard packed gravel. Mile 4.0 (6.5 km): As we cross a “Bundestrasse” or a major road, my rear bicycle brake falls apart. Fortunately, I carry spare brake pads so within 15 minutes, we are on our way again with the brake repaired. Mile 8.5 (13.6 km): This picture is of the Cloister in Weinhausen. The west wing and chapel are from the 14th Century. We take a break here just outside the walls surrounding the cloister. 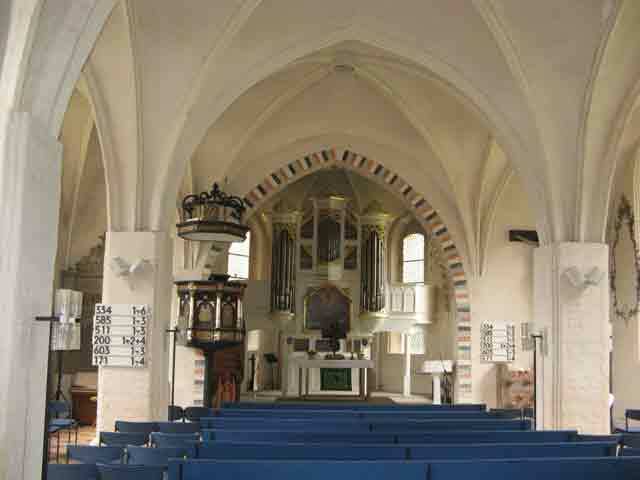 While in Langlingen we checked out the local historical church. It was built in 1340 then added to over the centuries. Next to the church is a Schloss. Leaving Langlingen but before Müden, we encounter a sandy road with a hard packed gravel path for bicycles alongside. The path is very easy riding, the road is impossible to ride because your wheels sink into the sand and you fall over. Ask me how I know this. Mile 21.3 (34.3.1 km): Müden. 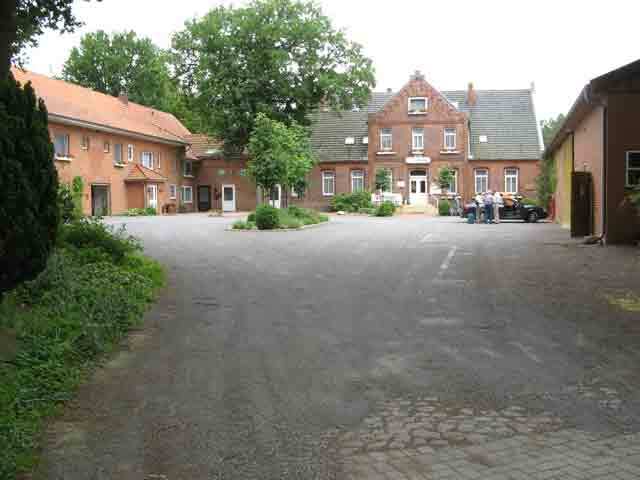 Mile 31.4 (50.6 km): Gifhorn. 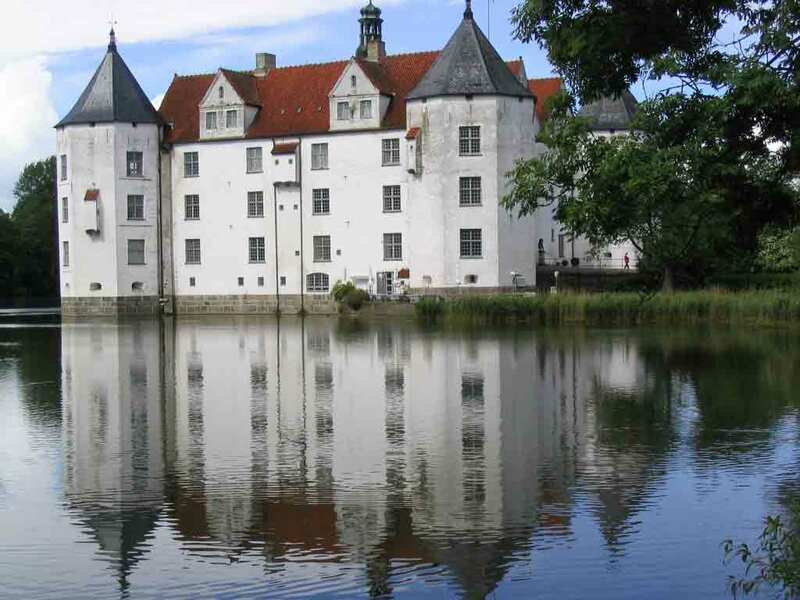 Schloss Gifhorn built as moated castle in 1525 and the nearby cloister is from is from 1346. We spend the evening at Hotel Alte Münze owned by Jane Kornhass, the address is Fallerslebener Strasse 7, 38518 . You can make reservation via their website http://www.hotel-alte-muenze.de*. 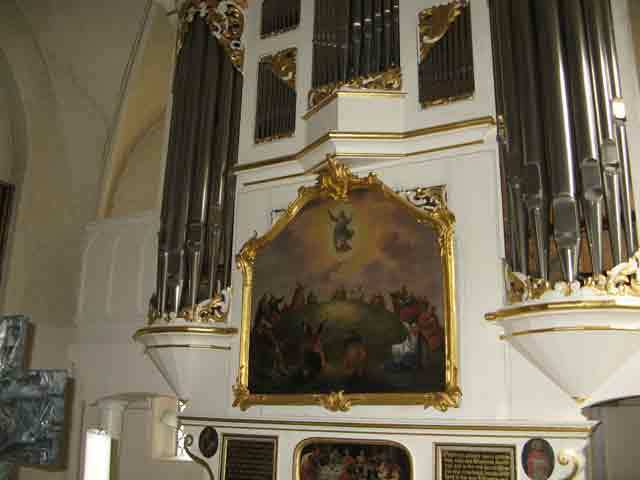 The email address is alte_muenze@t-online.de. The telephone is 05371-52771. They charge €65 for two people for one night. They have only 8 rooms. Day Overview: Today, we encounter some gravel as soon as we leave Gifhorn. However, overall, the path is mostly paved. There are only a few hills but two or three of them are real hills. 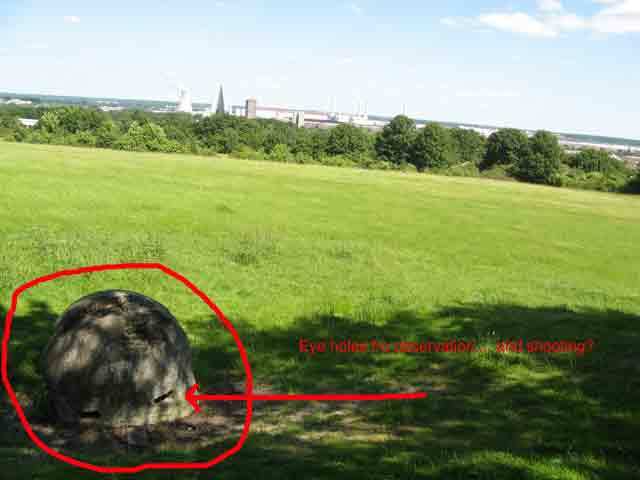 The first real hill is in a park on the edge of Wolfsburg. It is a pusher. If I were to do it over, I would simply take city streets around this hill. The only thing worth seeing is an observation point that I show you in the picture. Of course, you do get a good view of the VW factory but who cares about a view of industrial buildings? There are also a couple of smaller hills past Wolfsburg including a long boring, wet, slightly steep hill in the forest just before we stop for the night. You will also encounter short stretches of gravel path. 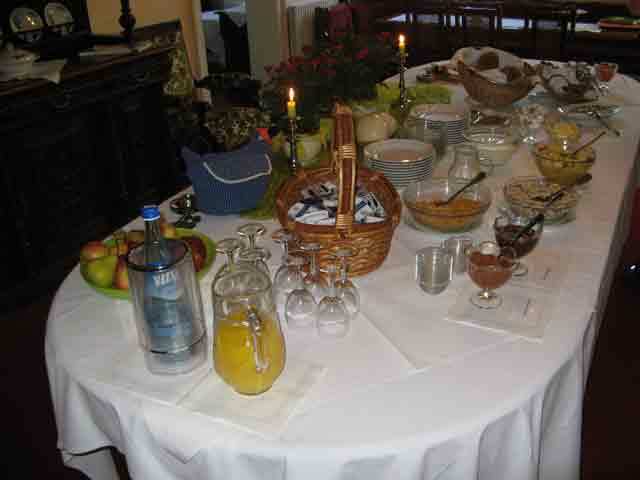 Mile 0 (0 km): The breakfast at Hotel Alte Münze is fine. 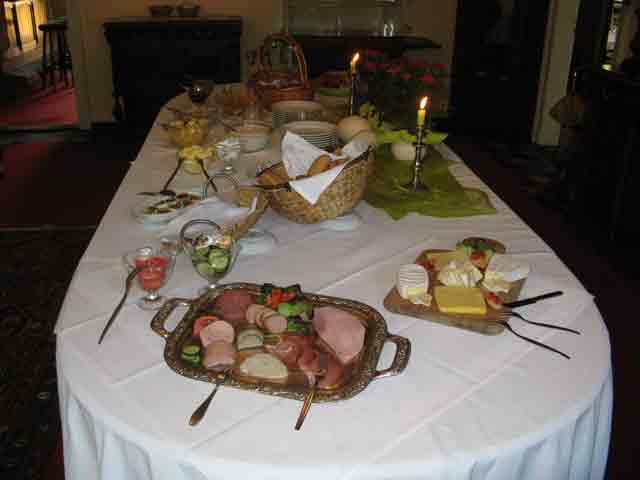 It is the normal type of breakfast we have come to expect on our bicycle tours. Typically breakfasts on the road include hard rolls, a selection of Wurst and cheeses, some jam or marmalade, coffee or tea, and a hardboiled egg. Mile 3.4 (5.4 km): We start the day on pavement but quickly switch to gravel once outside Gifhorn. 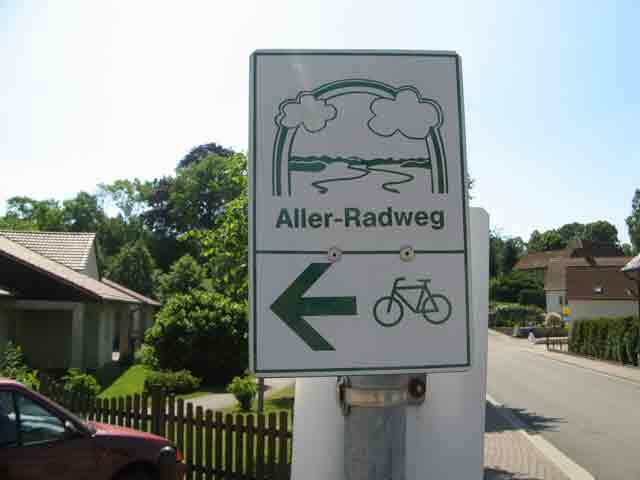 Mile 8.7 (14.0 km): After crossing the Mittelland Kanal (a 400 kilometer waterway from Berlin to the Rhine and out to the North Sea) we ride toward Wolfsburg. Mile 16.0 (25.7 km): Wolfsburg. We just rode over two hills, one was not even marked on the map in the guidebook. I presume that the local chapter of war veterans changed the path to go up and over the second hill in the park overlooking the VW plant in Wolfsburg. That is a dirty trick as far as I am concerned. I took a picture of the only reason to be up here, a one man bunker that was an observation post during WWII. One can easily miss it if you fail to read the historical sign. Mile 17.8 (28.6 km): This is a formerly double-moat castle near the downtown Wolfsburg pedestrian area. A few more miles down the road, we cross back and forth between the former eastern state of Sachsen-Anhalt and Neidersachsen. 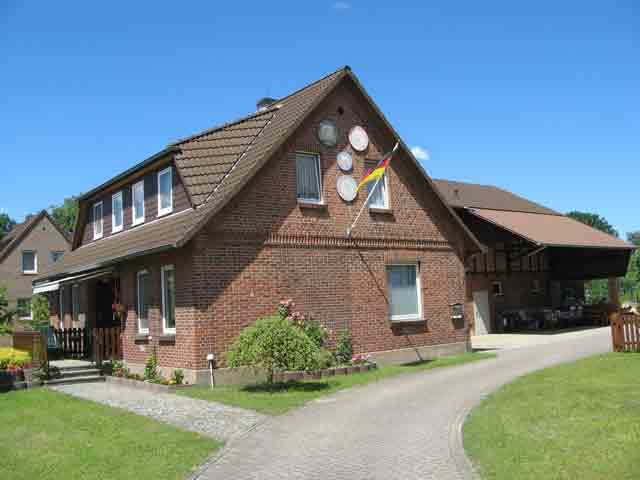 Mile 26.7 (42.9 km): Oebisfelde-Weferlingen. This morning we thought we would stay here but the weather is nice and we are not tired so on we go. 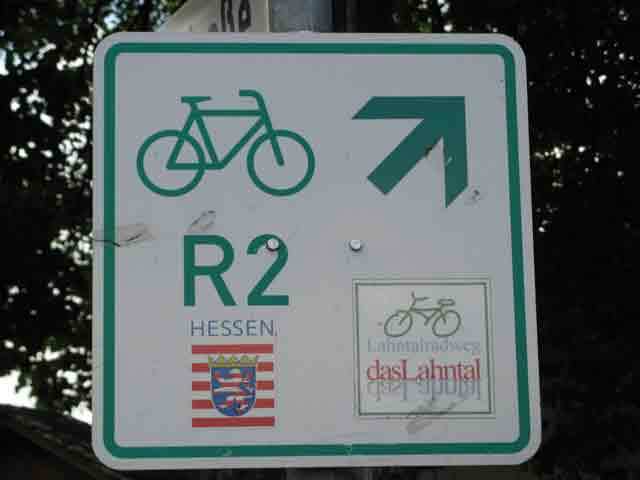 We ride south following the border between the two states towards Lockstedt and Weferlingen – where the fun begins. 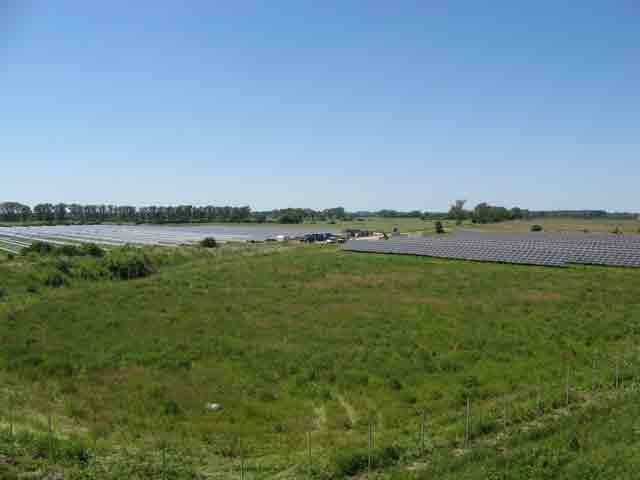 Mile 28.1 (45.2 km): We pass a large solar array that converts sunlight into electricity. I have a photograph but my lens is not wide enough to capture more than about 20% of the whole installation. Mile 34.1 (54.3 km): Lockstedt. In a kilometer or so we cross back into Lower Saxony. There is another sign about the border here but the sign painter may be confused about the date the wall came down; this sign reads 1990, almost a year after it came down. 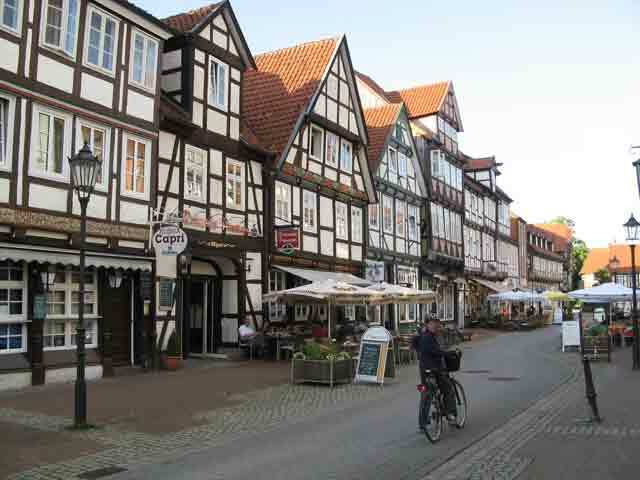 Mile 26.7 (42.9 km): We climbed a small hill getting to this village of Weferlingen. 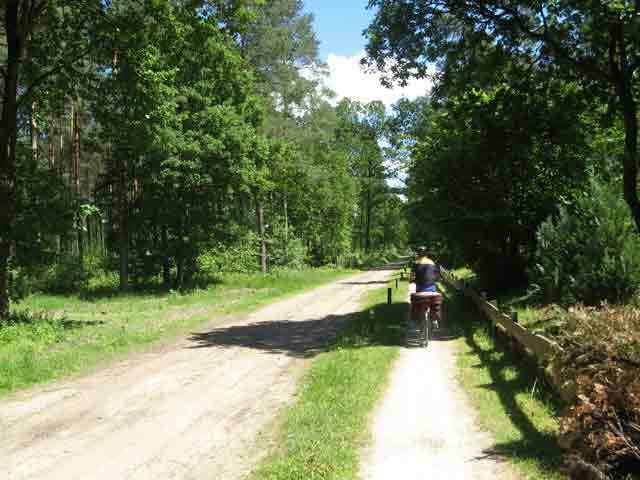 But now we are climbing a long hill in the woods following a bicycle path not shown on our map. We are advised by a local man to take this way to the crossroads where there is a hotel between Weferlingen and Walbeck. On dry days, the path is OK but if it is raining, do not come this way, take the medium traffic road. In the rain, this path would be a muddy disaster. The road is paved but would not be much fun either. The woods are lovely dark and deep but we have a rendezvous with Bier to keep; but this darn hill is slowing us down, bleep, bleep, bleep. Ok, ok, so I am not much of a poet. Mile 41.9 (67.5 km): We stop for the evening at 5:00 PM. That is way too late by our own standard rule to find accommodations around 4:00 PM but the weather is nice and except for that darn hill, the ride was pleasant. 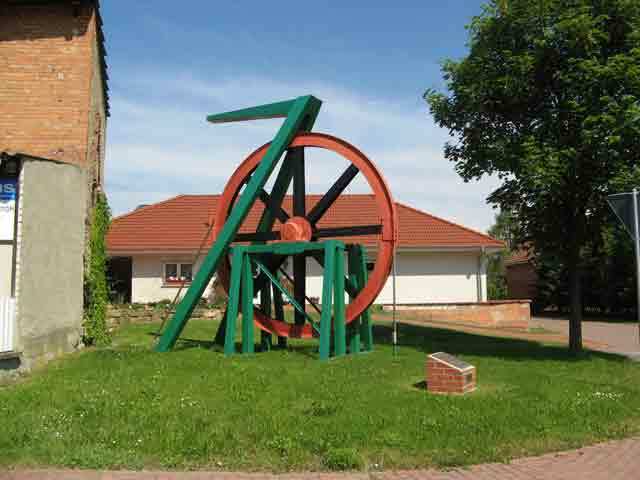 At the crossroads of L42 and Schlagbaum Strasse, we stop at Waldgaststätte Barriere Rehm. It has four double bedrooms and four single bedrooms. We pay €60 (2010) for two people for one night in a room with two single beds. This Gaststätte is a clean and recently remodeled establishment however the building has been here for over 100 years. The Gaststätte is within the former 5-kilometer Exclusion Zone of the wall between the former East and West Germany. Even so, it remained open, operated by the community of Weferlingen for the pleasure of ranking members of the Communist Party of East Germany, and their few friends who could be trusted not to bolt to the West. 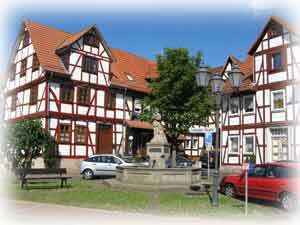 The name Waldgaststätte Barriere Rehm is translated as forest guesthouse Rehm (the owners' name). The name Barriere actually comes from a time long before the wall, even before the First World War when there was a police station nearby that guarded the border between the two German states. The police operated a barrier or “Barriere with a Schlagbaum” a wooden arm that can be raised and lowered. The hosts, Herr and Frau Rehm, are friendly and helpful when I try to make a small repair on my bicycle. Day Overview: Today it is bright and sunny. Outside of Walbeck we encounter a little loose gravel and many potholes to dodge. Mile 0.9 (1.4 km): Coming into Walbeck we climb a small gradual hill but enjoy steep drop of over 100 feet into the center of the village. I am thankful that we did not try to find lodging in Walbeck last night because they have none. We would have had to climb back up that same drop to pedal 1 km back to Waldgaststätte Barriere Rehm. 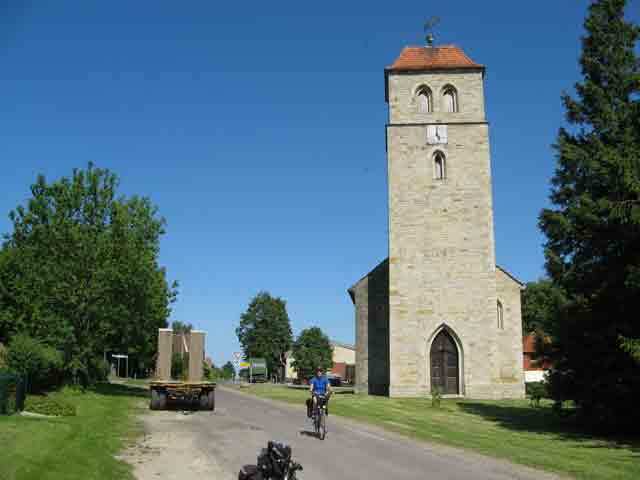 Mile 13.7 (22.1 km): The edge of Beendorf is near the top of a gradual 80-foot hill but the path then drops into the center of town. Historically, Beendorf is famous because of the salt mines around here. During WWII the salt mines were used as munition dumps and for munitions manufacturing. I take a picture of a roadside, … ahh… chunk of equipment that has to do with salt mining (perhaps a ventilator?). Anyway it is a memorial to miners who died in the mines between 1897 and 1898. The plaque is a little unclear, at least to me who cannot read German well. Mile 9.5 (15.3 km): After climbing a long gentle hill, we arrive at the Helmstedt Bahnhof. From there we depart for home. We ride this tour in 2010 during the Soccer World Cup held in South Africa. Both Germany and Holland did well with Germany making the semifinals and Holland played Spain the championship. Germany beat Uruguay for third place. Soccer (football, Fussball, Voetbal, fútbol are all European words that sound alike) is the national sport in many European countries including Germany. People here decorate their homes, their public places, themselves, and as shown here, their pets. 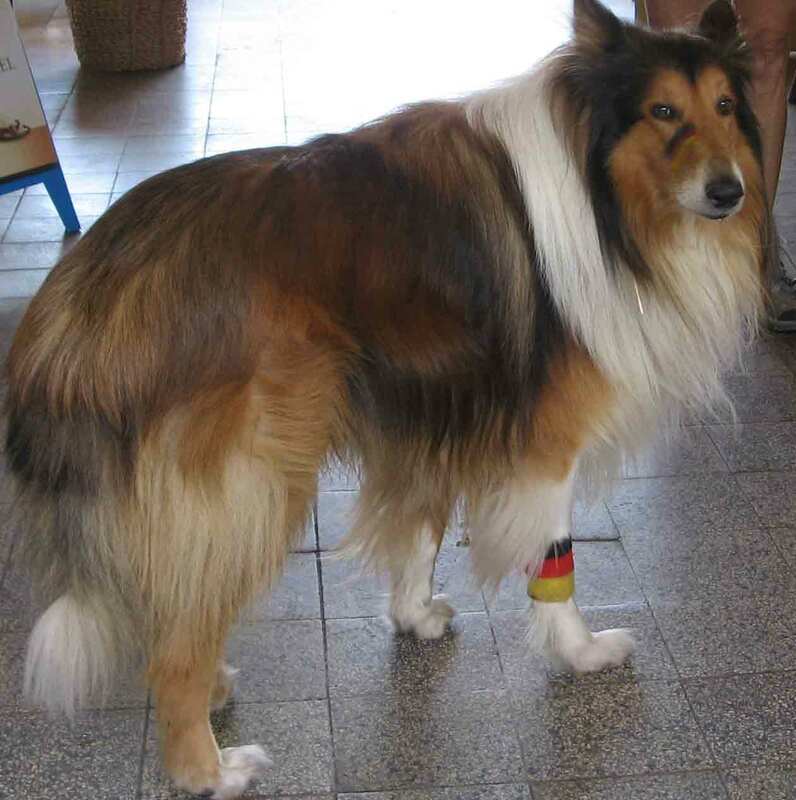 Note the black marks under the dog’s eyes and the, uhh … wrist band?, on its front leg.